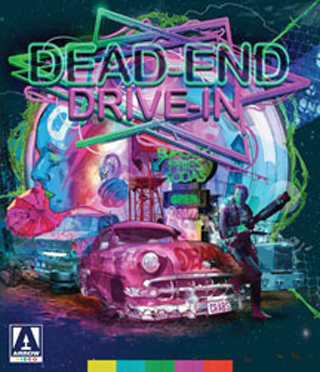 Dead End Drive-In is an original film to say the least. I saw it back on late night cable when I was much much younger. I instantly fell in love with it due to the punk rock look and feel. At the time I had no idea really what I was watching I just knew it was unique and different. I saw that Arrow was putting out a collector Blu Ray and decided to jump right on it. And like with all my Arrow releases I am happy I did. Dead End is set in “The Near Future” economy is totally crashed and random gangs have caused massive crime waves all over the country. The most valuable thing at this time is cars and car parts. The government decides to control these gangs, and roaming punk kids in a modern concentration camp way. They begin working with Drive in Chains, They surround them with electrified fences and allow no cars on the long path to them. Kids go in to watch a film and their cars are sabotaged so they cannot leave. The cars are slowly striped and sold off for parts and the punks who own them are stuck there as they cannot escape. Most of them however don’t really mind. They are fed junk food all day, given drugs of their choice, and watch exploitation movies on the drive in’s big screen. In fact some homeless people just go, knowing what the place is for simple shelter and food. The main plot follows a new punk named Crabs and his Girlfriend as they become trapped in the Dead End Drive-In and try to escape. Problems arise when she begins to accept and even grown fond of the drugged out lifestyle. If you’re a fan it’s a must have as it’s a gorgeous print of this classic film. If you have never seen it its definitely worth getting. It’s an amazing that that is not only a personal favorite of mine, but of Quinten Tarentino as well.